L: 23" x W: 23" x H: 26.5"
Tory End Table Achieve an on-trend look in your living room with the Tory end table. Combining weathered wood and black metal materials, this table provides a ton of visual interest and a casual feel. Plus, the shelving's metal rungs offer perfect contrast with the sleek, oiled wood. Achieve an on-trend look in your living room with the Tory end table. Combining weathered wood and black metal materials, this table provides a ton of visual interest and a casual feel. Plus, the shelving's metal rungs offer perfect contrast with the sleek, oiled wood. We love the rustic / industrial look of our new end table! We saw it paired in the store with the sectional we bought and had to have it! We also purchased a matching coffee table with it! I purchased this side table along with its matching round coffee table for a low-level living room space. I love the rustic look and will stand up to a busy family life. Great for the rustic farmhouse look. I love the sleek, clean design of this table. Bought a lamp at the same time. Looks great in our living room of Raymour & Flanigan furnished apartment!!! I have been very happy with everything purchased and this table now completed the living room very nicely! The look I was hoping for! Thanks! 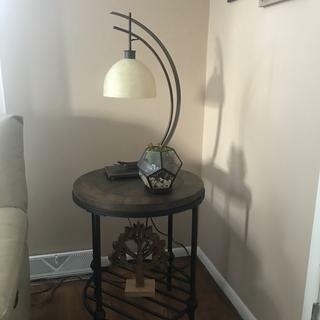 Raymour & Flanigan lamp also! My whole house is Raymour & Flanigan actually! ?? The Torry Tables were a perfect selection for the Briarwood Couch. We purchased this end table and coffee table set and absolutely love it! They are stunning. And the round table design is perfect for our accident-prone toddler! We used it for our family room and have received so many compliments on it! We could not have been more happy with the way it looks! A definite must buy! It is durable with our little ones! Wish I had purchased two!